Electric Shock is a condition that occurs when there is a flow of electricity through that body. It is usually caused by contact with poorly insulated wires or ungrounded electrical equipment or by being struck by lightning. The severity and effects of electric shock depend mostly on the amount of current passing through the body and the duration of contact. A slight, harmless shock produces only a jarring or startling sensation. Severe shocks produce muscle contractions, which lead to muscular spasms, paralysis, unconsciousness, or death. A fatal electric shock is called electrocution. Burns may occur where the current enters and leaves the body. Though water in a chemically pure form is a weak conductor of electricity, with salts dissolved – it becomes an excellent conductor. Here is a newsitem reported in Times of India of date ........... on how a dog saved 6 people from electrocution, sadly by dying. As the Gummidipoondi-Chennai Central local train touched base at 8.45pm on September 3, people jumped out. Many were going home, some others had to catch connecting buses and trains. Six commuters came out of Central station, paused for a few minutes, and were greeted by the warm earthy smell that emanates minutes after a downpour. All of them reached home that night. They probably would not have. In those few minutes that these six men had paused, a few metres away, an Indian mongrel barked, then jumped into a puddle of water and became lifeless. Seconds later, the commuters realised that the pool of water in which they were about to step had a live wire snapped from an electrical line. The dog had barked to warn them not to step forward. When it saw that the commuters paid no heed, it took its final leap. Death came instantly, commuters were stunned by what they saw as an act of supreme sacrifice. The dog that died left behind a litter of 10-day-old pups. Residents of the area adopted all of them, but, probably because of the mother's absence, two died. “On Wednesday night, a broken high voltage wire fell in a pool of collected rainwater inside the railway premises. The frantic dog kept barking but people shooed it away. It dashed ahead, jumped in the water, and gave up its life,” said General manager, Blue Cross. People informed Railway Protection Force inspector, who cordoned off the area. 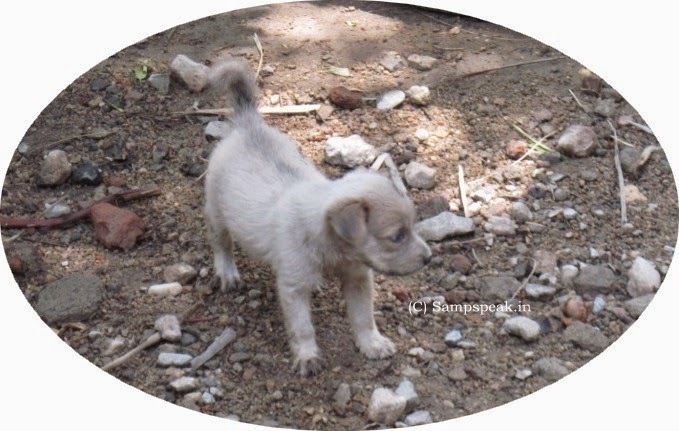 “When RPF personnel reached the spot, they found a litter of puppies. We rescued them and gave them to Blue Cross,” said the official. As the news about the dog’s death spread, Blue Cross volunteers received a huge response for adopting the pups.